What's new in the world of high availability for DB2 in 10.5 (GA through the latest fix packs)? For followers of DB2, you're sure to have noticed all of the great enhancements and capabilities that have been made to DB2 since 10.5 was released less than two years ago. In particular, there has been a continued focus on availability improvements, and in particular with the DB2 pureScale feature, right from the original release of 10.5 through the various fix packs that have been released since then. In this session you will hear about all of the most recent updates, including some very exciting new features that improve availability, scalability and usability. There are also some things available that make it much easier for you to give pureScale a try. If you are using pureScale today or are thinking about using it in the future, you’ll want to see how you can take advantage of these latest and greatest features. Does your organization suffer from generational shifts in technology, business pressures and dwindling IT skills? IBM autonomics and the IBM Management Console for IMS and DB2 for z/OS can help close the gap between yesterday’s IT implementation and tomorrow’s IT demands. While autonomics is aimed at eliminating the repetition of manual day-to-day tasks, the Management Console aims to increase user efficiency by consolidating information from IMS and DB2 for z/OS systems in a single interface that is easily accessible from a standard web browser. Join Chris Holtz, IBM IMS and DB2 Modernization Architect, as he explains the gamut of information from architectural design, installation, and capabilities. Chris will also give you the details so that you can obtain this no-charge IBM offering to view and manage the overall health of your IMS and DB2 for z/OS systems across the enterprise. If you want to deploy DB2 BLU then it is not only important to know how big a server to use, but also what some of the tradeoffs are when selecting a particular kind of processor or server model. In this talk, we will cover the basic approach used for sizing, the latest server models and our picks of favorite server models. DB2 Analytics Accelerator: Trends and Directions - What's new? The DB2 Analytics Accelerator transforms your mainframe into a highly-efficient transactional and analytics processing environment. This enables you to exploit your z Systems data at the right time to take advantage of new opportunities to improve efficiency and drive smarter outcomes. Join this complimentary webcast to learn the latest news, trends and directions of IBM DB2 Analytics Accelerator. The webcast will be immediately followed by a live question-and-answer session. This webcast will also be available for replay after the event. John Campbell @GURUDB2 will focus on "DB2 11 Migration Planning" and Real Customer Experiences . 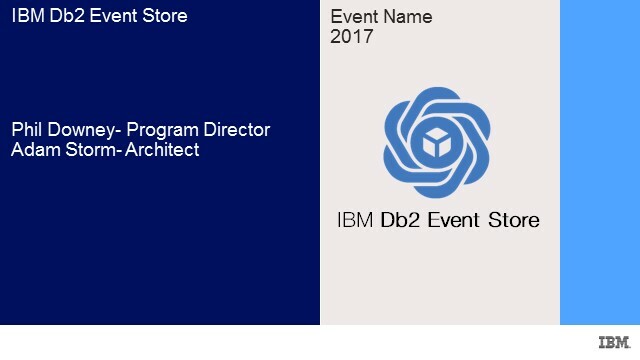 DB2 11 is one of the most stable releases in history based on customer feedback and IBM has seen the fastest uptake with many customers in production. There are several reasons why customers are looking to upgrade - one of the main reasons is due to the explosion of "Data". 90% of the world's data has been created since the release of DB2 10. DB2 is proven technology to handle large volumes of data regardless variety or speed. The initial response to DB2 11 has been extremely positive many customers have seen the “cost savings" with many customers seeing “CPU savings” as promised. However it is essential to follow “IBM Best Practices” to reap these benefits. To help facilitate your migration, and ensure your organization remains competitive John Campbell will provide planning information about migrating to DB2 11 for z/OS. This presentation will be two part series June 16th and 17th. The presentation will share surprises, pitfalls and lessons learned; provide hints and tips; discuss enabling fast start; and share the latest news about migrations. This is a unique opportunity to catch the top hints and tips from John, there will also be an opportunity for a live Q&A session. John Campbell @GURUDB2 will focus on "DB2 11 Migration Planning" and Real Customer Experiences . This is PART 2 of the webcast of the DB2 11 Migration Planning Series of webcasts.John Campbell will provide planning information about migrating to DB2 11 for z/OS and continue to share surprises, pitfalls and lessons learned; provide hints and tips; discuss enabling fast start; and share the latest news about migrations.This is a unique opportunity to catch the top hints and tips from John, there will also be an opportunity for a live Q&A session. Topics To Be Covered:-· Simplifying statistical views· Using statistical views to provide the optimizer with more information· Choosing an optimal query access plan by modeling complex relationships Target Audience:- Database administrators and managers; IT and enterprise architects managers IBM® DB2® for z/OS® customers expect improved performance in each release, while maintaining the stability and reliability to which they have grown accustomed from the mainframe environment. DB2 11 continues this theme with significant attention given to improved plan management, runtime optimizations and new access path choices. Staying current with the latest releases can make your life a lot easier – and reduce costs.Join us for this complimentary webcast as we discuss incremental query optimization enhancements to the DB2 11 for z/OS cost-based optimizer. Unleashing information locked in IBM z Systems of Record and Systems of Engagement enables new business-relevant insight. Next best action, viral marketing campaigns, 360° customer insight, or real-time contextual customer care require insight that is derived from integrating systems of engagement with systems of record. Huge amount of data from both types of systems need to be analyzed and understood in context to enable state-of-the-art Systems of Insight. This webcast provides an overview on existing use cases, monetization aspects, integration scenarios, and architecture patterns that are underpinned by integrating DB2 for z/OS, IDAA, InfoSphere BigInsights, and SPSS Modeler. Since we are interested in your point of view, we will allow for sufficient Q&A time throughout the webcast. Topics include: Complementing existing 'traditional' analytical capabilities with Big Data analytics, e.g. by making use of text analytics and Natural Language Processing (NLP) as part of IBM InfoSphere BigInsights. Enabling true mixed Hybrid Transaction/Analytical Processing (HTAP) workloads and delivering a single workload-optimized system with ODS capabilities using IBM DB2 Analytics Accelerator (IDAA). Analyzing data from Enterprise-owned systems of engagement (e.g. call center transcripts, e-mail traffic, Facebook), and data from external systems of engagement (e.g. Twitter tweeds, Blogs) and putting this in context with transaction insight from data on IBM z Systems. Exploring and visualizing big data and deriving to business outcome oriented insight prior to complex transformation, e.g. through IBM Watson Explorer. Integrating Hadoop data repositories as part of a System z centric data reservoir, e.g. by leveraging IBM InfoSphere Information Governance Catalog. Speakers: Namik Hrle, IBM Fellow Eberhard Hechler, Executive Architect Martin Dirk Schneider, Manager Data Warehousing CoE Developed for: Line of Business, IT leaders, enterprise architects Technical level: Intermediate This is a unique opportunity to catch the top hints and tips from John, there will also be an opportunity for a live Q&A session. Business, regulatory, and customer privacy continue to require tighter controls over access to your critical data stored in DB2. Is your data secure in DB2 on the Mainframe? Businesses have been protecting data from external end users for a long time on the Mainframe. New regulations and security concerns now require you to protect your data from internal or privileged users. Data base administrators typically use the DB2 system administrator authority, to perform their daily tasks. In many locations, the general use of the system administration authority is considered a security risk due to its ability to circumvent your security policies or processes. To eliminate the general use of the DB2 system administrator authority is a difficult and disruptive process. An database administrator can now be allowed to manage database objects or generate tuning statistics but have no ability to query user data. These authorities allow you to separate your DB2 administrators into system, database and security roles in order to achieve separation of duties and comply with your auditor demands. This session discusses several approaches that can be used to migrate off the system administration authority. IBM dashDB is a powerful, agile data warehousing solution on the cloud that puts an analytics powerhouse at your fingertips. Built with in-memory BLU Acceleration technology, in-database analytics and an intuitive, easy to use interface, you can get up and running with dashDB (and deriving business value!) in no time at all. In this session you will learn about the latest enhancements and offerings for dashDB, including new capabilities and options for scaling out your database and analytics environment. From the smallest data marts through to the largest data warehouses, whatever your needs are, dashDB has the right fit for you. Join us for this IBM QMF™ webcast where Tom Glaser, Senior Consultant and Data Architect at MasterCard®, describes how the enterprise uses QMF to provide the analytics needed to validate application logic changes, download into Excel and research across multiple data sources including PostgreSQL, solidDB and DB2 for z/OS. Tom will explain how QMF has been deployed throughout the company. The webcast will also show that QMF has evolved from a green screen product to a modern analytical solution that supports many data sources, is mobile enabled, and is tightly integrated with the IBM DB2 Analytics Accelerator. The new QMF is available as a one time charge product that is replacing the MLC features of DB2 for z/OS. Time: 11:00 AM EDT/3:00PM GMT The webcast will be immediately followed by a live question and answer session. This webcast will also be available for replay after the event. In 1997, the first version of SAP product for reporting, analysis and data warehousing was launched as "Business Information Warehouse System" or SAP BIW. Since then, many strategic changes took place to SAP BW and around the whole reporting aspect within SAP. IBM DB2 has supported SAP in these strategic shifts, and always improved the product to get the best performance at the lowest TCO possible for SAP BW systems. In this session you will learn why IBM DB2 was, still is and will continue to be the best database option for SAP BW and other SAP applications. Although there are other in-memory database options in the market including SAP HANA, the dominant role of DB2 databases in the SAP environments does not change. IBM DB2 holds a key role for SAP BW and other SAP applications. How do DB2 DBAs get into “the cloud”? What do we need to know to help our companies leverage cloud services and why should we bother (other than the CIO in my company is asking what our cloud strategy is for database)? In this session we will start with some Cloud 101 topics like what infrastructure as a service and platform as a service really means and what a DBA needs to know about each. We will focus on Softlayer which is IBMs cloud platform and also Bluemix which is the hosting location for dashDB and SQLDB (both of which are managed DB2 offerings in the cloud). I will cover where the softlayer data centers are as many companies have to comply with regulatory requirements for where their data must reside. I will also discuss how to create DB2 instances on the cloud and what you can and can’t do with them (that is, what DBA activities are managed for me and what do I have control over). We will complete the cloud 101 discussion with a DB2 persons view of how I link in other data services and why I would or would not use them like Cloudant, dataWorks, Watson Analytics and BigInsights on Cloud. Join us for this informative session covering the latest product enhancements for IBM DB2 Administration Tool for z/OS 11.2 and IBM DB2 Object Comparison Tool for z/OS 11.2. We'll cover the features that simplify complexity during change management, and increase management capabilities for the IBM DB2 Analytics Accelerator for z/OS. Elaine Morelli, an Executive IT Specialist on the North America IBM z/Series Database Tools Team, is our speaker. Elaine’s expertise is in DB2 data base tools arena with a specialization in DB2 Administration. Elaine has over 30 years I/T experience, 16 of which have been at IBM in the technical sales specialist role. In the past, she has been an Application Developer, a DOS/VSE Systems Programmer, a DBA for DB2, IDMS, Informix, and Oracle. Elaine is an IBM Certified Database Administrator for DB2 Universal Database for z/OS and Systems Administrator for DB2 Universal Database for z/OS.. Elaine has presented at various local user groups and technical conferences across the United States. How effective are you backup and recovery procedures? This informative session looks at the latest techniques to help you implement an effective strategy for your needs. We'll discuss what's new in backup and recovery, such how to make use of statistics. We'll also cover the latest features in the IBM DB2 Recovery Expert for z/OS v3.2 release, such as mass application recovery and redirected recovery. Our speaker, Hendrik (Hennie) Mynhardt, is a DB2-certified, Executive IT Specialist with IBM. He has led different technical projects for database customers in the USA and overseas. His special interests are systems performance tuning and backup/recovery. He currently provides technical consulting and pre-sales and post-sales support for DB2 for z/OS Engine and Tools. Hennie is a regular presenter at user groups and conferences worldwide. This Tech Talk will cover 2 parts: Part 1: a) Provide you an overview, proof points summary of the scalability, throughput and availability benefits of DB2 10.5 and DB2 pureScale for SAP for demanding SAP Business Suite / ECC / OLTP SAP NetWeaver transactional and/or batch workloads. Understanding that a significant majority of SAP Enterprise clients have already deployed or are rolling out broad and deep SAP ECC / Business Suite functionality, often with significant existing investments in configured and customized (zCode) business process aligned SAP application templates and functionality. These clients typically require excellent scalability, throughput and availability in combination with a mature and proven IBM SAP platform capabilities - e.g. low risk SAP Platform investment protection and evolution vs revolution. In the 2nd part of the Tech Talk b) We naturally lead into the competitive positioning of various "in-memory" database technologies - DB2 BLU, SAP HANA, Oracle's 12c "in-memory cache" and how these compare and contrast in real life. DB2 11 - Application Compatibility (APPLCOMPAT) - What you need to know! DB2 11 for z/OS introduces the concept of Application Compatibility to simplify migration. This session will introduce the concept and provide the information you need to know to exploit this new capability to simply your migration from DB2 10 to DB2 11. We will also cover how to exploit this new capability to identify changes you need to make to applications that may be affected by incompatible changes in DB2 11. Chris is a Distinguished Engineer with the DB2 for z/OS Development team where he has worked for 26 years. Chris is the team lead for the RDS Execution Engine team and has contributed to the design and implementation for many SQL related items over the the 11 releases of DB2 he has worked on. More recently, Chris has been working on improving the performance and scalability of DB2 for z/OS, as well as working with customer and vendors to successfully deploy DB2 based solutions. OMEGAMON XE for DB2 Performance Expert. V5.3 was released in May 2015. This webcast will focus on some of the usability and performance enhaOMEGAMON XE for DB2 Performance Expert. V5.3 was released in May 2015. This webcast will focus on some of the usability and performance enhancements that help you increase your ability to quickly identify performance issues before they become performance problems. For example, we'll show how some of the key DB2 Peformance indicators were moved to initial displays to speed up problem detection and resolution. We will also cover the enhanced integration capabilities with other OMEGAMON monitors and IBM DB2 performance products, such as DB2 Query Monitor. Changes were made to the popular Performance Database (PDB) and CSV input generator in response to your requests and needs. Many DB2 10 and 11 service stream enhancements were included to ensure continuity of currency for DB2 and OMEGAMON XE. Join Paul Kenney as he takes you through the latest release. Paul is a Senior Software Engineer and has been doing Software Development for many years on DB2-related tools. He is an Architect and a Development Lead for OMEGAMON XE for DB2 Performance Explert (PE) for DB2 for z/OS. He is also an IBM Certified Solutions Expert for DB2 Database Administration. ncements that help you increase your ability to quickly identify performance issues before they become performance problems. For example, we'll show how some of the key DB2 Peformance indicators were moved to initial displays to speed up problem detection and resolution. We will also cover the enhanced integration capabilities with other OMEGAMON monitors and IBM DB2 performance products, such as DB2 Query Monitor. Changes were made to the popular Performance Database (PDB) and CSV input generator in response to your requests and needs. Many DB2 10 and 11 service stream enhancements were included to ensure continuity of currency for DB2 and OMEGAMON XE. Join Paul Kenney as he takes you through the latest release. Paul is a Senior Software Engineer and has been doing Software Development for many years on DB2-related tools. He is an Architect and a Development Lead for OMEGAMON XE for DB2 Performance Explert (PE) for DB2 for z/OS. He is also an IBM Certified Solutions Expert for DB2 Database Administration. Organizations are no longer blindly buying or sticking with a database they have. There is now intense scrutiny amongst the different players /choices irrespective of whether a new DB is to be purchased, or a strategic choice is needing to be made for existing workloads. In this session, we will talk about why DB2 is the right choice for your organization when compared against Oracle for either Transactional or Analytical workloads. We will also cover the different aspects that organizations need to evaluate when looking at in-memory databases to know exactly what they are getting themselves into if they go with Oracle in-memory. Attend this session to learn about DB2 differentiators compared to other choices such as Oracle. Enterprise Predictive Analytics for the Business Analyst. Is your business risking a USD 100 million loss? How new IBM analytics technologies can help protect your data and your bottom line. Is your business risking a USD 100 million loss? How new IBM analytics technologies can help protect your data and your bottom line It’s not news that data breaches are becoming an almost daily occurrence. This significantly elevates the risk to your data, your bottom line and your business reputation. Unfortunately, the business requirements of right-time analytics can create an IT infrastructure that has a side effect of increasing your risks. Fortunately, new technologies are available that can help enterprise clients meet the demands of CPU-intensive data analytics while simultaneously improving data security. With an emphasis on reducing IT TCO while providing the business insights you need to succeed in an increasingly competitive marketplace, technologies like IBM DB2 Analytics Accelerator have the potential to transform your organization. Organizations that have implemented these new technologies have been able to: ● Reduce system costs ● Increase data security ● Accelerate system performance Register now for the IBM Webcast where Shantan Kethireddy, Master Inventor and a Technical Sales Specialist, IBM Big Data & Analytics and Avijit Chatterjee, Ph.D. STSM, z Competitive Project Office, IBM will share their insight and expertise on how IBM clients are using new technologies to drive highly secure, right-time analytics. Real Time Analytics Query Performance with DB2 for z/OS! Real Time Analytics Query Performance with DB2 for z/OS What are the types of analytics workloads? And where should they reside? Analysing your DB2 for z/OS operational data in real-time had obvious appeal to your business, but what are the query optimization and design implications? Hear from DB2 development about what they have learned working with customers to ensure successful query performance with real time analytics on DB2 for z/OS. Streamline your SAP BW solution by keeping only most necessary data in memory, moving warm data to Near-Line Storage. This allows you to maintain a lean SAP BW database and sustain high performance. With the PBS and IBM DB2 BLU NLS approach, you gain additional benefits: near real-time performance on the NLS database, ultra fast loading times from the online database to the NLS storage, and extreme compression which allows you to keep your data footprint even smaller. Join @GURUDB2 John Campbell, IBM Distinguished Engineer this webcast is on demand. John will introduce and discuss opportunities available in DB2 10 and 11 for z/OS to use larger size real memory to reduce performance cost through reduced CPU resource consumption and improved elapsed times for transactions and batch processing. The following specific target areas will be covered: larger local and group buffer pools, use of large page size frames, thread reuse with RELEASE(DEALLOCATE) for IMS/TM and CICS and DDF applications, larger global and local dynamic statement cache, and in-memory data cache. This is a unique opportunity to catch the top hints and tips - please register to attend the webcast of you are on a different time zone. This is a pilot webcast to see if we should do more webcasts in other time zones. The DB2 Utilities Suite has always been known for its timely and dependable support for everything DB2 for z/OS from beta thru GA and beyond. As a DB2 for z/OS customer, you count on the reliability and integrity of your DB2 data. This has been a fundamental requirement as well for IBM. Over the past several DB2 releases, the IBM DB2 Utilities have delivered significant performance enhancements that drive down costs, while allowing you to grow your data and business. In addition, IBM has we have responded to your customer requests that have enabled you to simplify your software portfolio. Find out why customers and software providers have made the IBM DB2 Utilities Suite a worldwide leader for all your data management tasks. Join Haakon Roberts, IBM DE and Architect, who'll cover the following topics: •Why the IBM DB2 Utilities Suite is an essential component of your database management system •Latest performance and usability enhancements since the release of DB2 11 •A peek into the future of IBM DB2 Utilities Haakon Roberts has nearly 30 years' experience working with DB2 on the mainframe platform covering various aspects of systems programming, database administration, software support and development. He is a Distinguished Engineer at the IBM Silicon Valley Laboratory in San Jose, California, the chief technical architect for DB2 for z/OS Utilities and Tools, and a leading expert in data integrity, availability and problem resolution. He is a regular speaker on these and other topics. In this session, we will revisit the scalability and continuous availability offered by DB2's pureScale feature and recent enhancements in the technology, e.g. VMWare support using TCP/IP for cluster interconnect. Along with new ways of licensing pureScale, e.g. DB2 Business Application Continuity Offering, have made it easier to get up and running with wider support for commodity hardware and a very cost-effective license model. Introducing What's New in IBM Data Server Manager V1.1.2 IBM Data Server Manager is a simple, scalable and smart database monitoring, administration and performance management solution. This is the next generation of database tooling that will help you reduce complexity, increase operational efficiency and meet SLA's across all data stores in your enterprise, whether hybrid, on-premise, or on the cloud. Learn about new support for DB2 for z/OS and IBM BigInsights along with increased monitoring support for DB2 for Linux, UNIX and Windows databases. IBM DB2 Analytics Accelerator: What's new in Version 5.1? The IBM DB2 Analytics Accelerator continues to rapidly evolve, delivering exciting new capabilities with each release and version. The IBM DB2 Analytics Accelerator Version 5.1 enables faster, more sophisticated reporting and deep analytics application integration, delivering sophisticated analytics on the z Systems platform. It supports the full lifecycle of a real-time analytics solution on a single, integrated system that combines transactional data, historical data, and predictive analytics. Ultimately, this drives insight based on real-time data. This webcast will discuss how Version 5.1 delivers a new dimension of analytical processing by introducing in-database analytics and in-database transformation, opening even more possibilities for new and innovative use cases. In this session, we will share technical details so your business can quickly and efficiently exploit these new features. What you really need to know about conversion to Extended log RBA and LRSN including real world experience"
Can you use your SQL skills for big data? Can you use your SQL skills for big data? Come an learn how IBM Big SQL and DB2 for Big Data can help you uncover the treasures within your data. We will discuss how Hadoop and Big SQL give you a fast path to analytics to enable rapid BI prototyping and help you be more agile. Combining various types of data together to get fast insight from traditional RDBMS and IBM's Hadoop based platform is becoming the norm for many organizations. Many practitioners are curious to leverage standard SQL to query these data platforms and remove boundaries between them. Business analysts want to establish linkages to tap into this wealth of information to gain insight and a competitive advantage in the market. DB2 11 for z/OS introduces the concept of Application Compatibility to simplify migration. This session will introduce the concept and provide the information you need to know to exploit this new capability to simply your migration from DB2 10 to DB2 11. We will also cover how to exploit this new capability to identify changes you need to make to applications that may be affected by incompatible changes in DB2 11. Chris is a Distinguished Engineer with the DB2 for z/OS Development team where he has worked for 26 years. Chris is the team lead for the RDS Execution Engine team and has contributed to the design and implementation for many SQL related items over the 11 releases of DB2 he has worked on. More recently, Chris has been working on improving the performance and scalability of DB2 for z/OS, as well as working with customer and vendors to successfully deploy DB2 based solutions. Riding the wave of DB2 data? Learn how Navy Federal Credit Union Mastered it! With the enormous growth and amount of data, how do you keep your head above water and not lose critical availability? Join us as Paul Walters from Navy Federal Credit Union discusses how to reorganize large amounts of data in support of expanded DB2 11 RBA format. Paul will discuss how he was able to use IBM’s DB2 REORG and DB2 Sort for z/OS to meet his performance goals while reducing CPU usage. You can remove the guess work of sizing temporary work data sets once and for all. Paul will also cover best practices that you can immediately apply in DB2 11 REORGs to get more zIIP usage and shrink your maintenance window. Effective analytics relies on two key attributes - easy access to the right data and cognitive capabilities. Apache Spark(TM) is an analytics platform the helps deliver on these two requirements through easy access of data, inteligence of the data through machine learning and advanced analytics methods. Learn how the combination of Apache Spark running on data rich platforms such as IBM z Systems can lead to business agility and deeper business insights whether you data is stored in a RDBMS, Hadoop clusters, graph databases locally or remote. Whether you are a business analyst, data scientist for application developer, Spark can help set your business free and differentiate you in the market place. Abstract: This session will introduce and discuss the valuable and much needed major enhancements in DB2 11 related to continuous availability including data sharing. The Data Sharing enhancements will include: group buffer pool castout, CF DELETE_NAME, Restart light, locking, indexing and DSNB355/356I messages. The Availability enhancements will include: BIND/REBIND/DDL/Online REORG break-in with persistent threads, IFCID 306 support for old compression dictionaries, online alter partition limit keys, deferred alter PIT recovery, DROP Column, Workfile instrumentation, defer define object processing, extended RBA/LRSN, and auto clean-up of pseudo- deleted index entries. IBM Cloud Data Services provides a wealth of options for developers of new cloud and mobile applications. This webinar will cover the open source and IBM databases that can be accessed through the IBM Cloud, providing examples and guidance to ensure that you choose the right option for your needs. This session will introduce many of the enhancements contained in QMF 11.2.1 announced on May 10, 2016. This release offers a new data services option which expands the reach of QMF's analytics capabilities to new sources on System z: VSAM, IMS, ADABAS, Sequential data, and SMF data. This adds to QMF's ability to access most structured and nonstructured data sources such as Oracle, Sybase, Hadoop and more. Additionally, this release has added a new, self-service Business Analytics interface that provides an easy to build and share capability for creating a multitude of charts, dashboards, and more. The new theme for QMF is: QMF Analytics: anytime, anyplace, anyone. We will highlight the options that prove this claim. This release of QMF offers advanced data federation capabilities that deliver data with speed and simplicity using System z resources such as zIIP processors up to 99% utilization and query parallelism for optimal performance. We will conclude with a demonstration of the new QMF self-service Business Analytics feature as well as the ability to access multiple data sources. Many customers still rely on on-premises database systems to run their transactional and analytic workloads. While we have been busy enhancing our database technology and cloud offerings, we've also come up with a new release of DB2. Attend this session to hear about all of the enhancements that are planned, how they will help you with your existing workloads, and how we are making it easier for you to adopt this new release. In many cases, an organization's most valuable data -- the "run the business" data created and accessed by transactional applications -- is stored and managed in an IBM z Systems environment. Often, these same organizations are not deriving maximum benefit from this most-valuable data because they are not leveraging the transformational insight that can be gained through real-time analysis of that data where it lives -- on z Systems. Join Robert Caterrall, IBM Senior Consulting IT Specialist, z Systems Data and Analytics, for the May 17 webcast. During this webcast, attendees will gain an understanding of key concepts such as real-time analytics, right-time analytics, in-transaction analytics, and in-transaction predictive scoring. Robert will also cover technologies that enable real-time analytics on z Systems, and usage scenarios illustrating the business benefits that can accrue from putting these technologies to work. The goal is increasing workload while reducing costs. IBM tooling in support of developers, administrators and analysts is becoming an important consideration in driving OLTP and Analytics data store growth and extending deployments into new LOB environments. Data Server Manager provides core Administration, Monitoring, Tuning and Configuration and now supports heterogeneous IBM Data Stores including DB2, DB2 on Cloud, DB2 on z/OS, dashDB, and BigInsights SQL. You'll learn about moving customers from legacy Optim products to Data Server Manager and in addition insight into full scale production deployments of DSM. Finally we'll review some recent capability deliveries related to enhancing the value of DB2 PureScale, BLU, and dashDB environments. We'll also discuss our common data server driver environment and DB2 V11 deliveries including support extensions related to throughput, manageability and new environment support like iOS. We'll also discuss how this relates to the DB2 Connect extension supporting System z and IBM i platforms. More organizations are becoming data driven, enabling widespread use of analytics across the enterprise, which requires collaboration and interaction with data coming from many sources to gain greater insights. This is creating different user roles who now drive application design. The use of new technology opens the aperture for greater analytic insights, while reducing complexity, data latency and operating costs. This webcast focuses how IT is critical to realizing the goals outlined by the application users. We’ll cover specific customer use cases using the IBM DB2 Analytics Accelerator and the IBM DB2 Analytics Accelerator Loader. Many organizations are deploying databases in the cloud, either entirely or as part of a hybrid environment, to reduce capital IT expenditures and conserve on-premises data center resources. How do you keep data protected at all times? With data security threats becoming ever more prevalent and powerful, security is a critical part of any database environment. But are you giving it diligent attention every time you build, upgrade or migrate your organization’s database? If cloud computing is in your plans (or already in use at your organization), be sure your cloud database offers data protection that’s as strong as its on-premises equivalent. This presentation will provide an overview of the security mechanisms that are available with IBM DB2. We will also go over key considerations when planning to move your database environment from the data center to the cloud. Are you looking for new ways to solve some of the same complex DB2 for z/OS administration tasks? This session will help you learn new methods that can also save you time and duplication. We’ll cover some of the new features in change management, additional product integration, usability and additional support for DB2 Analytics Accelerator for z/OS. If you are a new, existing or potential IBM DB2 Administration Tool and/or Object Comparison Tool user, you’ll see the continued investment that IBM is making to improve your data management tasks. DB2 12 is the latest release of DB2 for z/OS. It expands on features and functions of DB2 11 to provide your organization with capabilities needed to meet growing demands of the future with more scalability and speed, support for the next era of applications and devices, and faster analytics insights. This session looks at how the IBM portfolio of DB2 Utilities and Tools for z/OS allows you to unlock those features of DB2 12 on your timeframe to meet your business needs and stay competitive. We’ll go into details on some of the most anticipated and tested features from the DB2 12 Early Support Program. The support you rely on in IBM’s DB2 Utilities and Tools will let you take advantage of DB2 12 faster and easier. Deriving insight from data is vital as organizations strive to deliver competitive insight and gain optimal business advantage. Maximizing the value of “all” data, now requires a new type of analytics ecosystem. This session will discuss modern approaches to integrate current IT investments with new open source and hybrid cloud options to become a truly data-driven organization. The session will include discussions on: Gaining continued value from established data warehouses and BI systems; extending core capabilities with Zones of Capability including the Data Lake and Data Labs; making data more easily accessible to emerging personas like data scientists, citizen data analysts, and application developers; and delivering multi-speed IT services through hybrid cloud and other appropriate architectures. Creating an analytics-ready ecosystem by leveraging and extending your existing investments will enable you to better protect sensitive data; assure the integrity of production environments; make the complexity and inconsistencies of production data more consumable to data scientists and analysts; integrate new innovations in data platforms and analytics engines more easily; and help your users quickly find and employ the data they need to generate high impact business decisions. What's new in OMEGAMON XE for DB2 PE for z/OS? This webcast covers the IBM premier DB2 for z/OS monitoring solution, OMEGAMON XE for DB2 (OMPE). We’ll focus on the latest enhancements delivered in the V540 release that was delivered in the 4th quarter of 2016. OMPE was overwhelmingly used by the IBM DB2 12 Early Support Program (ESP) customers. This session will cover: •DB2 12 for z/OS support •Monitoring improvements, including customer requirements •Extended monitoring support for DB2 Analytics Accelerator Norbert Jenninger is part of the IBM Analytics (DB2 Tools group) at the IBM Germany R&D lab. He joined the DB2 Performance Monitor team in 1994 with responsibilities for development and architecture after 16 years in application development for a production planning system. In his current position, he works as a customer advocate and product manager for DB2 Performance tools. Norbert is the focal point for requirements and market needs. DB2 12 for z/OS was released on October 25, 2016. The IBM DB2 Utilities were there every step of the way providing complete, unquestionable support, even before the start of the Early Support Program (ESP). Many of you will be aware of the agile development model that has characterized the IBM DB2 Utilities Suite over recent years, a model that is inherently suited to the IBM utilities and the Continuous Delivery process in DB2. It is a model that, beyond DB2 12, has delivered over 30 enhancements since the start of 2016 alone. Find out why customers and software providers trust and rely upon the IBM Utilities Suite to manage their data now and into the future. Join Haakon Roberts, IBM DE and Architect, who will provide a comprehensive overview of what is new in IBM utilities in DB2 12 and also cover a number of the recent major availability, performance and usability improvements that have been delivered via APARs that you can take advantage of today. QMF 12 introduced transformative updates to the QMF TSO client which modernize the TSO client into an analytics tool not just for DB2 for z/OS, but for the entire enterprise. Join Robin Zalud in this webcast to gain an understanding of all the new benefits of the QMF 12 TSO client, including its new abilities to analyze non-DB2 data such as VSAM and Oracle. Other updates include additional IDAA support, performance and storage improvements, folder support, and an enhanced editor. The evolution of Data Server Manager into IBM DB2 tooling continues. This webcast looks at the recent enhancements delivered in IBM DB2 performance tools that are realized in Data Server Manager (DSM) for z/OS. We’ll focus on application performance showing how you can easily identify and prioritize your top SQL statements displaying more information while using less system resources. Learn how you can tie in application performance with database performance to get maximum results using less resources. We’ll also show an example of how to perform end-to-end tuning of your application, pulling in the necessary information that lets you: •	Define the collection period you need •	Access and refine view of your system's query activity •	Collect host variable and parameter marker information •	Deploy selectivity override profiles for access path improvements •	Compare workloads to see access path improvements and improved CPU consumption Saghi Amirsoleymani is a WW Principal Solution Advisor at Rocket Software and IBM Champion, where she evangelizes solutions for customers and partners on IBM technologies. She travels throughout the world presenting on various topics related to Data Studio, Data Server Manager, Analytics and Performance at conferences, users groups, webcasts and events. Maryela will show how existing assets on z/OS can be made available in the era of application assembly through new functionality in DB2 and z/OS Connect V2. She will introduce new DB2 V11 functionality to define SQL and Stored Procedures as services. The Application Programming Interface (API) Economy has changed how developers think about building application and how organization deploy software as a service. Mobile devices have accelerated the shift to provide services via API. Maryela will show how existing assets on z/OS can be made available in the era of application assembly through new functionality in DB2 and z/OS Connect V2. She will introduce new DB2 V11 functionality to define SQL and Stored Procedures as services which can be called from anywhere through REST API with enterprise-level scalability and performance. The DB2 support integrates with additional service management capabilities offered in z/OS Connect. There are rich new features in DB2 12 to extend the Data Sharing capabilities that so many DB2 environments rely upon. These features address performance, availability and flexibility requirements. This session will cover asynchronous lock structure duplexing for same-site or multi-site Parallel Sysplex performance, lock avoidance improvements, page registration reduction, automatic retry of GRECP/LPL recovery, DB2 peer recovery, and enhancements for DDF clients including session tokens and XA global transaction support. DB2 for z/OS and FlashCopy: Practical Use Cases With the explosion of data volumes today, businesses are looking for ways to copy huge volumes of data very quickly – from seconds to minutes – with minimal disruption to the running of applications. In this presentation, you will hear about practical use cases for IBM FlashCopy technology in a DB2 for z/OS environment including non-disruptive data integrity checks, FlashCopy image copies allowing for instant restore, SHRLEVEL(CHANGE) consistent image copy backups, system-level backup and recovery. We will provide many hints and tips on how to set up your environment, share lessons learned from customer experience and address common pitfalls. global and dynamic statement cache. Be a BI Superhero! Transform your Existing QMF TSO Queries into Powerful Visualizations - It's Simple! QMF 12 delivered powerful functionalities that can transform QMF TSO users into data visionaries. QMF 12 supports DB2 9, 10 11 and 12. Join us for this QMF Webcast where Doug Anderson and Robin Zalud will explain how QMF can take existing QMF TSO queries and use them to create insightful visualizations. This powerful capability quickly leverages the existing inventory of QMF queries in the enterprise, allowing all users to use the intelligence gathered over the years to be used in new business dashboards. Users with approved access credentials can be BI Super Heroes, by quickly deploying in-depth self-service analytics to their entire enterprise. And with QMF 12, those existing TSO queries can be joined with data from most enterprise data sources, making citizen data scientists out of all QMF users! Machine learning can help optimize every interaction with your customers, anticipate risk more accurately and improve your organization’s operations. It uses historical data to train predictive models that can then be used to anticipate future behavior. When combined with your most current enterprise data, machine learning can help you make the right decision, at the right time. 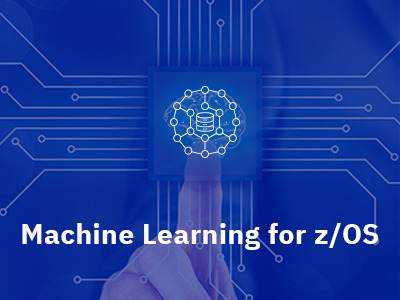 How can QMF help you leverage IBM Machine Learning for z/OS? Machine Learning is a key technology that can revolutionize the way z Systems data can be analyzed to model better business outcomes. And, an integral part to the Machine Learning process is the preparation of raw data that is fed to the Machine Learning workflow. DBAs and data architects can leverage QMF to access and prepare raw data from a wide spectrum of data sources while providing data scientists secure access and governance. What just happened and how do I fix it? Db2 Analytics Accelerator: What’s new? QMF is bringing its power and ease to the distributed platforms! On July 14th, QMF Analytics for Multiplatforms became generally available. This distributed platform only solution is aimed at customers that had inquired about QMF’s visualization, dashboarding and graphical ad-hoc query capabilities on non-z/OS platforms. This new solution brings the web, workstation and visualization components and capabilities of QMF to non-z/OS customers. Join us in this webcast were Frank Fillmore will highlight how QMF Analytics for Multiplatforms is being used by one of his customers to modernize their operations. We also will discuss in more detail the features of QMF Analytics for Multiplatforms. We will conclude with a demonstration by Doug Anderson that will include the new updates to QMF’s data visualization interface. Join us in this short webcast where Frank Ziemba will showcase the benefits of Collaborative Analytics with QMF. 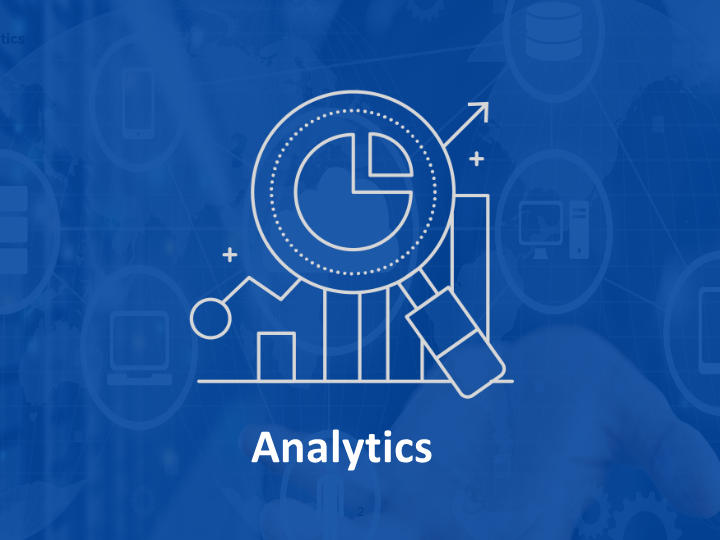 Linking analytics and collaboration solutions enables business analysts to discover, connect and collaborate to solve analytical problems with tools like wikis, blogs and messaging. Frank will explore how QMF's visualization interface (QMF Vision) enables discovery of problems with triggered or scheduled dashboards created from live data from z Systems and/or non-z data. QMF then allows business personnel to act and share their view of the solution, in real-time with peers or decision makers via collaboration tools like IBM Connections, IBM Watson Workspace, or Slack. Are you a Db2z developer or application architect? Accelerate development experiences with new technology! Are you a developer or application architect? Accelerate your development experiences with new DB2 12 technology! This webcast is aimed at any developers and application architects currently working with Db2 for z/OS. We know that modern development practices have changed and organizations are demanding more agility, speed and at a reduced costs. Get the most out of your investment in data science skills by integrating machine learning models with transactional applications to optimize every interaction and decision with the freshest enterprise data. Data scientists’ skills are valuable and the models they develop are vital to the business. Maximizing the impact of your data scientist skills is dependent upon the currency of their data source, latency of execution and the way models are deployed and monitored over time. The lowest latency and freshest data exists within engagement applications on transactional systems. Integrating machine learning models with transactional applications gives you the ability to optimize every interaction and decision. Companies today are looking for new ways to take advantage of their mainframe-based data and processes that have been the backbone of their business for decades. These companies recognize the need to transform to a digital economy and are considering all options. The question is how to move forward? Many companies know that their ability to define and innovate is dependent upon their success in recognizing the business value that exists in mainframe applications and data. These companies want to capitalize on those assets as they transform. One of the common themes identified is the fact that modern application development can no longer wait for IT. Agility, speed, quality and efficiency are paramount. This webcast looks at how mainframe customers are updating their application development processes while continuing to leverage mainframe strengths that are vital to their business. STSM and IBM Master Inventor . Terry will be presenting the latest news and updates from the Db2 Optimizer in Db2 12. The performance focus from DB2 10 and 11 for z/OS has resonated very well with customers, and DB2 12 for z/OS takes this further to deliver significant performance improvements to new query workload patterns, and for improved scalability of your existing applications. This session will highlight the UNION ALL and outer join performance improvements, sort optimizations, improved predicate indexability and tighter integration of the Optimizer and RUNSTATS. And you will learn how these and other enhancements can enable improved exploitation of other DB2 features such as temporal or archive transparency, and allow analytics and other processing on real-time data with minimal impact to your operational systems. IBM Data Virtualization Manager (IBM DVM) unlocks the full potential of data on IBM Z to provide universal access to any application regardless of location or format required. This webinar will discuss how IBM DVM is addressing the challenges of the API economy by providing fast, real-time, in-place access to enterprise mainframe data to any application via modern APIs. Analytics is a key to success, but you need simplicity, real-time speed and security: how fast can you blend all the disparate data you need, analyze and share it, then take action all in a secure and controlled environment? 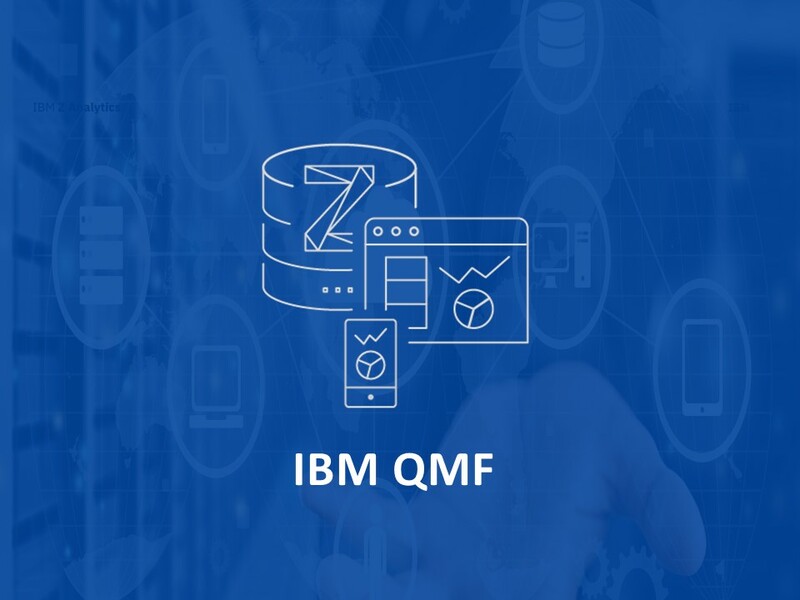 In this webcast, we will demo how IBM has transformed IBM QMF for z/OS into the solution that delivers analytics & visualizations for all IBM Z data empowering teams with machine learning-driven insights and personalization. Learn how to leverage QMF and IBM Collaborative solutions to enrich data with context, to build consensus. Cognitive, collaborative analytics helps teams take action in real-time, to work on the right things at the right time. You’ve been collecting data for years in your transaction systems. This data is unique to your organization. It’s data and potential insights that no one else has, or can have. The key to winning in today's hyper competitive environment is being able to leverage insight from your data at the point of interaction. For example, at the point an insurance customer submits an online claim form, when a consumer uses their credit card or when a system anomaly occurs that could lead to a service outage. Register for this IBM for webcast where we will discuss how you can take advantage of a full portfolio of technologies on IBM Z to expand your top-line growth and optimize processes while improving employee productivity and increasing customer satisfaction. Let us help your organization transform and innovate on an enterprise scale. Java workloads have proliferated on Db2. Due to gaps in understanding true database behavior, application developers find it challenging to code well behaved applications that are high performance with large data volumes and also have continuous availability. Furthermore, many customers have embarked on legacy modernization projects where COBOL and Java have to co-exist. This has increased the need for developing efficient programming models. Maryela will present best practices in all key areas of developing Java application against Db2 - connection management, resultset handling, load balancing settings, failover techniques, optimization of expensive resources such as Java objects and much more - to bridge the gap between applications and Db2. Every organization possesses a wealth of data. The true value of that data is realized when it is turned into insight that can change the way decisions are made. Today, organizations are harnessing the power of their data with IBM Z, the Db2 Analytics Accelerator and the Db2 Analytics Accelerator Loader to gain invaluable insight while protecting the security and reliability of that data. They are unlocking insights into other types of data without incurring additional costs, resources or specialized programming. IBM Db2 11 has been in the market for 4.5 years. Many customers have migrated to Db2 11, but have not yet taken advantage of the Db2 11 SQL enhancements. Db2 12 is the new kid on the block, and while many customers have begun migrations, they have not yet investigated the Db2 12 SQL functional enhancements. This session will provide information on the SQL enhancements contained in these two Db2 releases and how to take advantage of these enhancements. Db2 12 for z/OS: Improving Availability and Resilience. Southern Farm Bureau Life Insurance Company, (SFBLI) is a large and growing insurance firm throughout the southern USA. With expanding business, came significant Db2 growth and application challenges. Performance is key to SFBLI to provide the levels of service and response time needed by their customers. Learn how SFBLI conquered both system and application issues to streamline their Db2 environment by changing their performance methods. Join Brandon Hodges, lead DBA from SFBLI, as he shares their time and cost-saving practices. This webinar will provide a technical overview and highlight the latest enhancements to IBM Machine Learning for z/OS, an on-premises machine learning offering designed for organizations who want to gain the full benefits of machine learning with low latency and a high degree of resiliency and security. Moving mainframe data is expensive, time consuming and data limiting. You may have too much data and not enough time to move all the needed data for data lakes and data warehouses. But business analysts and data scientists need more information for data-hungry applications, causing ETL costs to spiral up. We have a better solution. 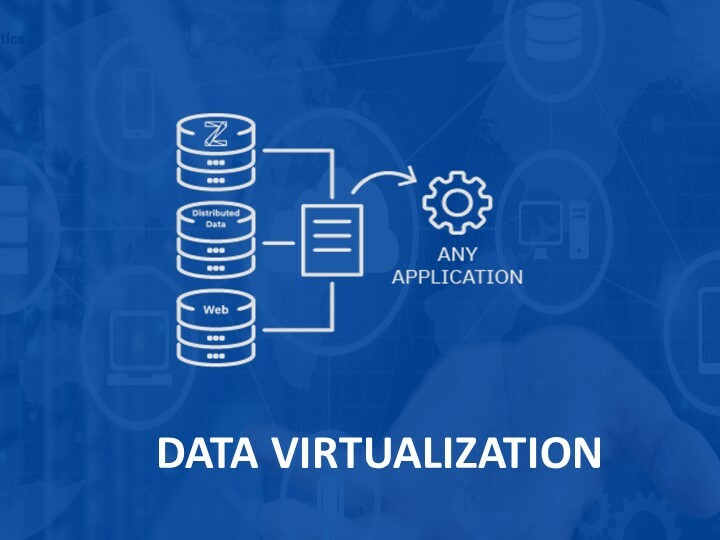 Join us in this webcast where Gregg Willhoit and Steve Mink will discuss the benefits that Data Virtualization Manager for z/OS (DVM) brings to ETL infrastructures. They will discuss the performance benefits and cost savings delivered by DVM when it is used as a data utility layer to quality and data integration solutions. With DVM, customers can speed up ETL by orders of magnitude and save mainframe costs since DVM mainly executes on zIIP engines. The latest QMF 12 enhancements are aimed at improving the performance of QMF workloads while saving costs plus modernizing the TSO interface. QMF 12 introduces a new component called the QMF Server and a new TSO interface named the "QMF Z Client". The QMF Server and QMF Z client enable workloads from Batch, Workstation, Web or TSO Users (via the new Z client) to be zIIP eligible, saving costs. What's New in Db2 for z/OS Database Administration? No one ever said being a Db2 for z/OS database administrator in 2018 was going to be easy. The amount and complexity of data has increased with the data management tasks you're asked to perform on a 24x7 basis. The IBM Db2 Administration Tool is evolving and being enhanced to reflect both industry and system changing needs. If you're a user of the IBM Db2 Administration Tool, you'll learn about recent enhancements, many of them requested by you and delivered by IBM. If you are not a current user, join the session to see why more and more companies are embracing the Db2 Administration Tool as their go-to-solution for solving today's data management challenges. Join IBM on June 5 for a webinar on the IT Operational Analytics solution template (ITOA) offered with IBM Machine Learning for z/OS. This solution template demonstrates how machine learning techniques can be applied to operational data, such as SMF, to gain unique insight into the health of IBM Db2 for z/OS subsystems. What does GDPR have to do with my Db2 for z/OS data? GDPR compliance (General Data Protection Regulation of the European Union) went into effect on May 25th of this year. GDPR has many facets and affects many things from how you manage your customer data to providing backup and recovery services. This webcast looks at GDPR and other topics that provide more data security and protection, such as Multi-Factor Authentication (MFA), Transparent Data Encryption (TDE), and auditing support for your Db2 data. What do you need to do to make sure your data processes are secure? The answer is attend this live webcast where you can also provide your input and feedback. We will simplify the new security concepts and help you navigate the sea of regulations. IBM Data Virtualization Manager (IBM DVM) unlocks the full potential of data on IBM Z to provide universal access to any application regardless of location or format required. In the past, previous data architectures struggled with real-time requirements, which are increasingly driven by today's 24/7 mobile world. No matter how fast data is collected and moved, it will never be as fast as real-time, in-place access. IBM DVM is the solution that provides fast, real-time, in-place federated acess to both your enterprise mainframe and non-mainframe data. This webcast will show you how data virtualisation's synergy with today's API economy can evolve the informaton architecture on IBM Z by modernising, accelerating and simplifying all enteprise applications that need mainframe data without actually moving the data. You will see how data from IMS, VSAM and Db2 can be federated using virtual tables and views and how REST APIs can be easily created to return the data in JSON format. As large enterprises continue their headlong rush into Cloud Computing and the DevOps movement continues to gather momentum, traditional Db2 for z/OS job roles are being forced to adapt. This presentation will provide a brief overview of these two increasingly important IT trends, and examine how they are directly impacting Db2 developers, DBAs and systems programmers. From cloud-oriented application design to fully automating Db2 schema changes, some practical guidelines are offered to help current practitioners thrive in this brave new world. Title: Security, Compliance and Data Privacy – GDPR and More! Practices and procedures for securing and protecting data are under increasing scrutiny from industry, government and your customers. Simple authorization and security practices are no longer sufficient to ensure that you are doing what is necessary to protect your Db2 for z/OS data. Of course, you have heard about GDPR, but do you know what it mandates your organization to do? And what about those other regulations? This presentation will examine database security and compliance from a Db2 perspective, giving you a broad, high-level overview of the current trends and issues… as well as some guidance on how to protect your Db2 databases. Db2 Analytics Accelerator Trends and Directions--What’s new? The new QMF Server which was introduced with QMF 12 brings important operational benefits. Its zIIP exploitation can bring CPU savings. Its ability to easily segregate users to specific data sources can simplify security compliance. And its deployment options across different platforms or LPARs caters to data gravity by bringing the analytics to the data. Additionally, QMF now adds IDMS as a data source, bringing the power of QMF analytics and visualizations to IDMS data. Join us in this webcast where Shawn Sullivan will go into detail on how to deploy the QMF Server and will also demonstrate deployment using multiple data sources including the newly supported IDMS data source. In today’s evolving environment, have your IMS applications needed to directly access data off platform? Or, have your distributed environments needed to join data from multiple IMS databases, DB2, or other data structures? IBM Data Virtualization Manager (IBM DVM) is the solution. It provides universal access and update of IMS data in place for any application. IBM DVM’s ability to federate and update any IBM Z data unleashes the insights of IMS data for the enterprise. n this webcast, Suzie Wendler and Ron Bisceglia will discuss how IBM DVM can be used to enhance your application environment to combine IMS data with any other data across platforms with minimal effort to IMS workloads. They will also demo applications working with IBM DVM to easily access IMS, DB2 and non-IBM Z data. Join the IBM webinar to gain insight on how your IBM Z data and infrastructure offers a unique analytics advantage in today' competitive environment. The webinar, hosted by Jonathan Sloan, IBM Senior Analytics Architect will spotlight Ray Wang, Founder and Principal Analyst at Constellation Research. Replay of IDUG Data Tech Summit Key Note at IBM Silicon Valley Lab - Check it out! As Db2 for z/OS customers you are adept at writing Db2 apps to access Db2 data. But what about when you need to access data from other IBM Z sources such as VSAM, Adabas, etc.? What about when you need to write applications using legacy programming languages and APIs? Data virtualization could make Db2 for z/OS your single point of entry for any live IBM Z data. Imagine accessing VSAM records via a SQL statement in a Db2 application. Or accessing Adabas data in a Db2 application? Or accessing IDMS data definitions via Db2 views? All of this could be possible for customers that have DB2 for z/OS when you add the IBM Data Virtualization Manager (DVM) solution. Join us in this session where Bill Powers will explore how to use the latest DVM enhancements to make DB2 the central access point to all IBM Z data. 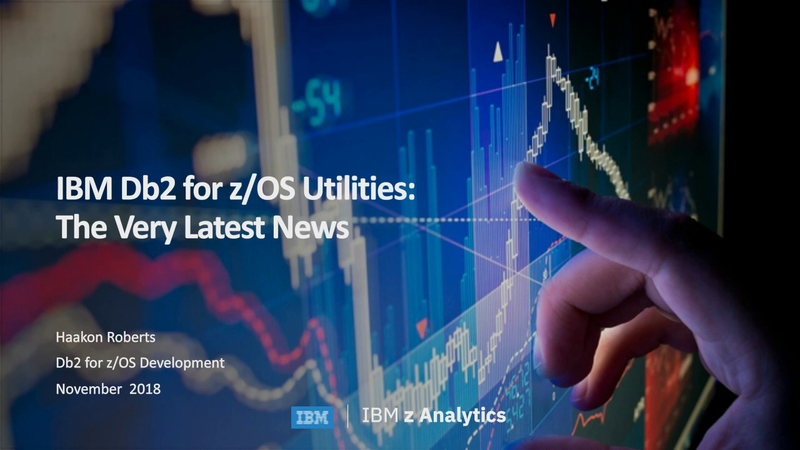 Db2 for z/OS Utilities Suite continues to deliver new features and enhancements to further simplify and reduce the cost of database management. Continuous delivery has enhanced the ability for IBM Db2 Utilities to deliver new features supporting not only Db2 engine enhancements, but deliver value to your business in terms of availability, performance and reducing overall cost. We'll focus on some of these enhancements that you'll find in Db2 12, as well as a significant number of them available for use with Db2 11. Join Haakon Roberts, IBM DE, who'll take you through descriptions and examples of the new features and functions. Check out how IBM Db2 AI for z/OS empowers the optimizer to determine the best-performing query access paths based on your workload characteristics using machine learning technology. The IBM Db2 Administration Tool is the go-to solution that many Db2 data professionals use every day. We’ve recently enhanced the product with capabilities that will be of interest to database administrators and application developers/administrators. Taking advantage of these new features delivered in the Db2 Administration Tool can improve your application performance, availability and reduce system resources. Your organization wants to modernize its Db2 mainframe application processes, but the question is how to do it? Where do you start? This session shows how to remove barriers that are holding your Db2 enterprise data captive in outdated methods and processes. This session looks at the entire life cycle of your Db2z development starting from application creation, deployment, testing in different environments with necessary feedback loop, driving a continuous integration/delivery pipeline all the way to deploying in production and then releasing the allocated resources. The result is delivering applications faster with reduced costs and less risk. Don't miss Jeff Josten, IBM Distinguished Engineer, DB2 for z/OS Development as he kicks off a discussion with Jonathan Sloan and Deng Ke Zhao on the IBM Machine Learning for z/OS solution templates. These solution templates include sample applications that demonstrate how predictive models can be consumed right within transactional applications on IBM Z for some of the most common enterprise use cases such as credit approval and payment fraud. AI is everywhere. But Artificial Intelligence is not replacing Business Intelligence. Instead BI solutions are being infused with AI and transforming the way business people make decisions and act. Join this webcast to hear the latest research from Wayne Eckerson, president and principal consultant of Eckerson Group, where he will discuss how AI is evolving BI solutions into tools that are quickly reshaping how data is analyzed and how decisions are made. 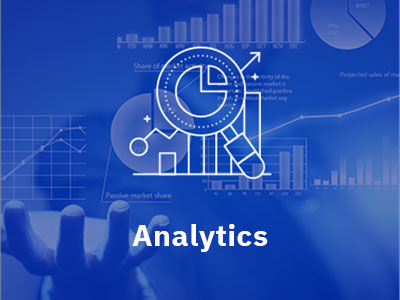 BI solutions that are driven by AI can automatically build reports and dashboards, surface insights quicker and transform the analysis process. In short, AI-infused BI solutions are easier to use, generate better insights, increase business productivity and save costs. Wayne will be joined by QMF Expert Rob Parker, who will demonstrate the latest AI driven capabilities of QMF Vision. We will also discuss new platform support and additional pricing options for QMF. Db2 for z/OS Utilities Suite continues to deliver new features and enhancements to further simplify and reduce the cost of database management. Continuous delivery has enhanced the ability for IBM Db2 Utilities to deliver new features supporting not only Db2 engine enhancements, but delivering valuable features to your business in terms of availability, performance and reducing overall cost. We'll focus on some of these enhancements that you'll find in Db2 12, as well as a significant number of them available for use with Db2 11. Are you using the Db2 Analytics Accelerator for your business-critical reporting and analytic workloads? If yes, you’ll want to obtain the maximum benefits possible. This session explores the latest enhancements, in OMEGAMON XE for Db2 Performance Expert (OMPE for Db2 PE), for monitoring the Db2 Analytics Accelerator. We'll look at how Db2 Query Monitor for z/OS (QM) can help monitor your accelerated-SQL statements. We’ll also cover new features in both products that can enhance Db2 for z/OS performance. Today’s applications need to provide answers using real-time information, regardless of where that data is stored or how it was stored. Access to this data is foundational to digital transformation and modern AI. IBM Data Virtualization Manager for z/OS allows users and applications access to z/OS and enterprise data sources in real-time, providing comprehensive data easily accessible by any application. It supports modern APIs to virtually all z/OS data types as well as the ability to access this data with Db2 using standard SQL. Join us for this session where John Northway will explain how Data Virtualization can transform your information architecture and turn your valuable mainframe transactional data into a competitive advantage. Join IBM experts Eberhard Hechler, Executive Architect, IBM Boeblingen R&D Lab and Shuang Yu, Watson Machine Learning for z/OS Development, IBM China Development Lab to learn how you can infuse AI into IT operations. They will provide an overview of IBM Watson Machine Learning for z/OS and discuss how it can be applied to a vast set of IT operational analytics use cases. You will learn how to apply AI to operational data, such as SMF records, to gain insight into the health of Db2 for z/OS, CICS and other subsystems; proactively avoid potential future outages and optimize your IT operational environment. The presentation will also discuss the complementary capabilities of IBM Z Operations Analytics (IZOA). Join Thanh Lam Hoang and Beat Buesser from the IBM Research team as they discuss a new capability in Watson Machine Learning for z/OS to automate feature engineering for databases with multiple tables. They will provide a step-by-step demonstration and share examples of machine learning models where accuracy improved significantly after applying this new technique. This automated approach to feature engineering can generate machine learning models from untransformed data, at its source, competing head to head with even the most experienced data scientists. Let’s be honest. Thinking about how you recover your Db2 data and/or objects is not something that’s on the top of your to-do list in a busy day. That’s where a solution like IBM’s Db2 Recovery Expert for z/OS comes in. It takes the planning and worry away from potential recovery situations, so you can focus on other tasks. This session covers different types of recovery situations and will show how quickly you can become operational after a recovery situation. Do you know the fastest methods to backup and restore your Db2s? Did you know you can monitor the progress of your recovery operations? We’ll cover some of these topics and recent customer-requested enhancements added to the product. If you are an existing QMF for TSO user, this webcast is for you! QMF gurus Robin Zalud and Shawn Sullivan will discuss the performance benefits of QMF12's TSO client, its productivity enhancements, API additions, and new functionality available through continuous delivery updates. QMF for TSO customers that migrate to Version 12 can see performance improvements through better buffer utilization, multi-threading and storage enhancements. And with QMF 12, all QMF objects and data sources are available to any application via REST and JAVA APIs. Most important, upgrading to QMF 12 for z/OS can save significant mainframe costs as it enables QMF batch and TSO workloads to run on ZIIP engines.